Here’s a network map of NITT I prepared myself. I was long wishing to know the campus network in detail and so today I finally took the job to create it myself. 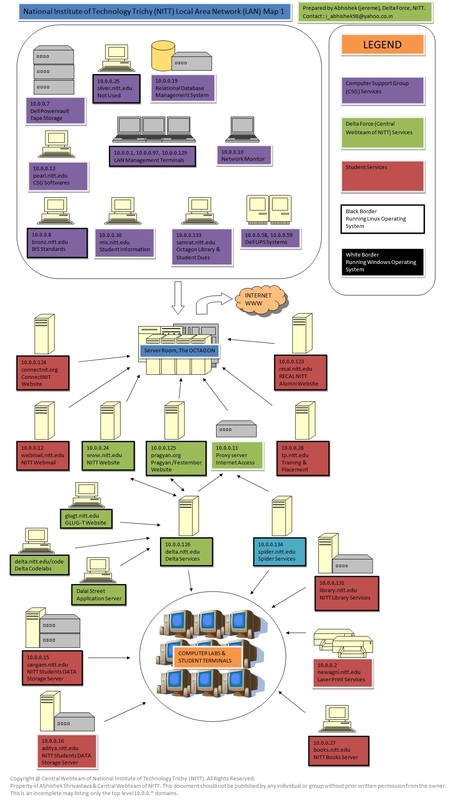 Using the only tool I had for network scanning – NMAP (or “network mapper”) I was able to extract some of the basic information about the servers of my college along with their IP addresses, DNS names and their Operating System. I even got their MAC addresses and open ports, a great tool nmap is indeed! To start with, unlike other colleges in the country, my college doesn’t provide NET Access in the computer labs except 1 which has just 99 systems. The Big OCTAGON or the Central Computing Center with lots of labs and workstations, has no net access for common students. Fortunately, Delta Force Members are allowed to access internet from one of the labs of Octagon called “Sun Lab”, named after Sun Microsystems , whose one of the employees and also the alumni of NITT donated 3 Sun Workstations and a number of Sun Terminals connected with those workstations forming a cluster. Although none of those terminal are currently online but there are around 6-7 computers running Linux and also including one Apple Mac, reserved only for Delta Members. So coming back to the college LAN, the OCTAGON has got a pretty cool server room which centrally has all the servers of the campus which are connected to the LAN. The OCTAGON is provided an 8 Gbps internet access through the Software Technology Park based in Hyderabad. As per my knowledge, there are 7 servers which have direct internet access through the octagon. These includes the Webmail (The Mail Server of NITT), NITT ( The Server in which NITT Website is hosted), Pragyan (The server reserved for hosting Pragyan and Festember Events website), TP (Training and Placement), ConnectNIT ( A project of connecting all the NITs in the country in a special network and enabling collaborative projects and events) and RECAL (stands for “Regional Engineering College Alumni”, the server which host its website). Beside these there is one more server with IP 10.0.0.11 which doesn’t host anything but is used as a Proxy Server for accessing internet for those who have access, which includes Delta Members and Spider Members and may be others who need. Delta has access to internet through 3 servers namely – NITT, Pragyan and 10.0.0.11. However only Core Members (that includes me) have access to NITT, which is always online. NITT and Pragyan comes under the direct control of Delta as they are responsible for the NITT Mail Website and Pragyan Website. Besides these Delta also hosts other servers (or actually computers turned servers) which are based on a local subnet of delta. They are used for some services like Codelabs (Programmer’s Corner of Delta), Dalal Street (An online stock exchange game hosted every year on Pragyan), GLUG-T( GNU Linux Users Group of Trichy of which I am a member too), and other multipurpose computers. In reality each of the computer delta owns can be instantly turned into a makeshift server and can host anything from Pragyan to Festember website to a heavy online application like Dalal Street. Delta provides most of the LAN Services to the students of NITT including a compendium of E-Books and Cool Softwares, besides providing access to Wikipedia, Times of India, Topcoder and SPOJ ( We are working on it ). Also some big projects are going inside Delta right now including a cool new template for the NITT Website and an iDelta portal similar to iGoogle. Besides delta, there is another group recently founded called the “Spider” Group. It doesnt calls itself a IT Group like delta is, but infact they call themselves a “technical” group that can work on any “technical” project. Well till date, there has been no proof of such a claim :). Anyways, they also own a server of their own thanks to the Dept. of Computer Science and Engineering, but recently there net access has been blocked due to heavy downloads and less work done ! So temporary they have been given net access through the 10.0.0.11 through the Delta Acccount. Yes, Spider doesn’t have authorization to access 10.0.0.11. Well other than Webmail, NITT, Delta and Spider, students have access to other servers like newagni.nitt.edu for high quality LASER printing services, books.nitt.edu which has a huge collection of E-books (unfortunately all of them are IT related), library.nitt.edu ( E-Library of NITT). Not to forget there are 2 grand servers – Sangam and Aditya. Both have a huge storage capability and every student of NITT has an account there and has got around 150 MB in Aditya and 300 MB in Sangam for storage. Both of these are accessible anywhere on the LAN and so students can access their files from any computer which is connected to the college LAN anywhere inside the campus. Besides these there are loads of other servers which are used by the CSG (Computer Support Group) of NITT, the incharge of Octagon for maintaining and monitoring the LAN and supervising the groups like Delta and Spider. There’s nothing much to talk about there servers. Okay so finally, I have also created a map of the LAN of NITT in MS Word. Forgive me for not using the Sun OpenOffice inspite of being a member of GLUG-T, but I just can’t seem to give up MS Word 2007. Well it looks cool to me. Here it is. Click for a full view and don’t forget to read the copyright notice.